I am rarely a fan of orange inks but Noodler’s Antietam is special. Antietam is a very unusual rust orange/red with great shading. I have been using Antietam this last week and I love it. 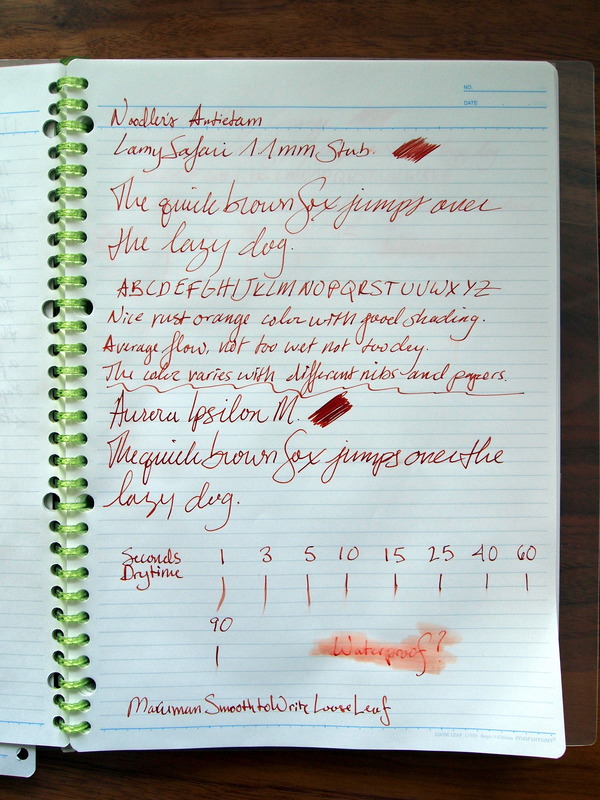 The color varies red to orange in different pens and on different paper; it is a real chameleon ink. The flow is good, not too dry not too wet. I tested this ink on Maruman Smooth to Write paper (my go-to for use with fountain pens) and used dry cotton swabs to test the dry time. Even after 90 seconds it wouldn’t fully dry; I got bored and gave up. The Maruman paper is quite smooth and for most ink I see an average dry time around 15-25 seconds. I did try later on more absorbent Exacompta 60gsm paper and it was near dry in 15 seconds and completely dry in 25. The ink is not waterproof; to test this I waited 5 minutes for the ink to dry and wiped the paper with a damp cotton swab. If you can put up with the long dry time Noodler’s Antietam is definitely worth a try. But the lazy dog bit the quick brown fox anyways and there was blood all over the page. Antietam is the closest thing to blood red I’ve ever seen; perfect for Halloween invites and poison pen letters.